Win a Free Guided Wild Hog Hunt! 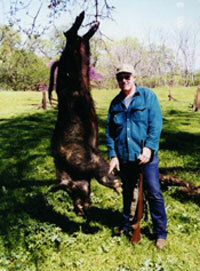 One winner will be drawn to go on a guided wild hog hunt in the King City area of California. Your guide will be Mark Williams of Mark Williams Guide Service. #1 - Sign-up for WesternHunter.com's free weekly e-mail. e-mail and have them enter your e-mail address as the person who told them about WesternHunter.com. #3 - E-mail us your hunting friends' e-mail addresses so we can add them to our weekly e-mail list. Every e-mail address is another entry for you! Can't wait? Click here Email Addresses for the Drawing. There is no limit to the number of times you can enter. Every e-mail address sent or sponsored by you gives you another entry into the drawing. Check Out His Hog Hunt!